Affordable Wheelie Machine - Model X60 - Stationary [X60STATIONARY] - $19,850.00 : Xtreme Wheelie Ride®, The Ride of Your Life! Ride a wheelie with no risk! With Xtreme Wheelie™ we take the risk out of riding a wheelie and the possibility of damaging the motorcycle. 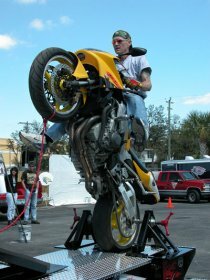 Learn how to ride a wheelie without the risk of getting hurt! Ready To Go - Out the Door! Copyright © 2004 - 2019 Xtreme Wheelie Ride.